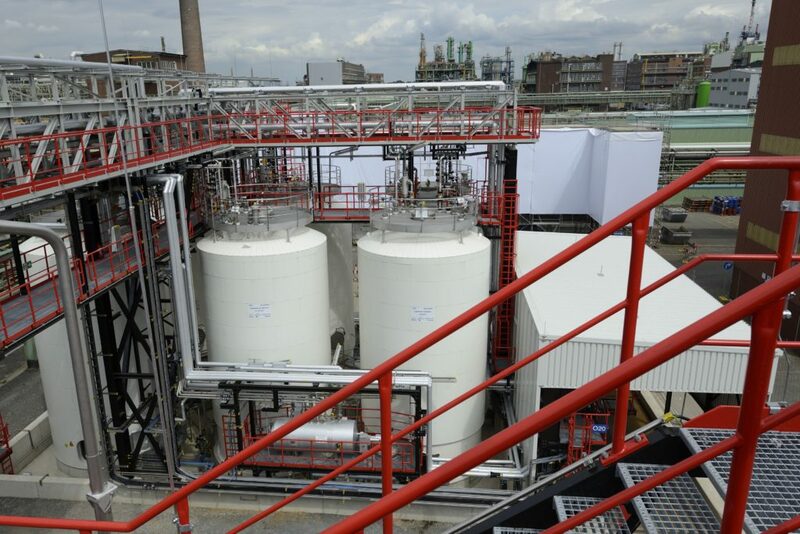 Cologne/Leverkusen – Cologne-based specialty chemicals company LANXESS has significantly expanded storage capacity for its phosphoric acid ester plant at the Leverkusen site, investing around EUR 8 million. The new storage facility for liquids consists of six 150 m³ tanks, giving a total volume of 900 m³, and replaces the previous, smaller tank farm, which had a capacity of only 145 m³. “With the new, much larger storage facility, we’re continuing to ensure reliable supplies of raw materials and boosting our ability to respond flexibly to changes on the raw material markets,” explains Karsten Job, head of Plastic Additives Business in the Rhein Chemie Additives business unit at LANXESS. As well as the expanded tank farm, LANXESS has also built a new unloading station to transfer raw materials from tankers. The new station has five bottom discharge arms and corresponding vapor recovery arms that transport the highly flammable liquids into the tanks in line with the strictest safety requirements. The new tank farm has already been completed and can go into operation as soon as official permit has been issued. This is expected by the end of July. LANXESS phosphoric acid esters are used in plastics as flame retardants, among other applications. The flame retardants from the Rhein Chemie Additives business unit come in two product lines – Levagard® and Disflamoll® – and offer significant advantages and excellent flame retardance, even in complex applications. The halogen-free phosphoric acid esters in the Disflamoll® range are suitable for a large number of plastics. They have proved particularly effective in PVC applications, rigid and flexible polyurethane foam applications and coatings, adhesives and sealants.